Description: This pedestrian-scale bronze sculpture is the sixth and final statue in a series of six monuments documenting "Black Wall Street" in Durham. 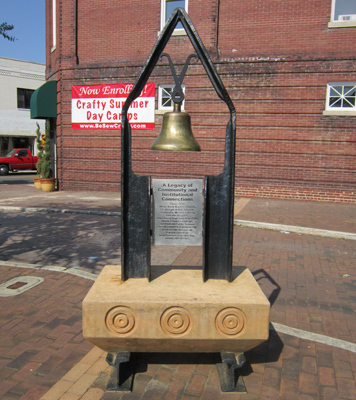 The monument features a large bronze bell. The sculpture illustrates the ties between important programs in the community, such as the Boys and Girls Club and Durham Public Schools, to businesses on Parrish Street. 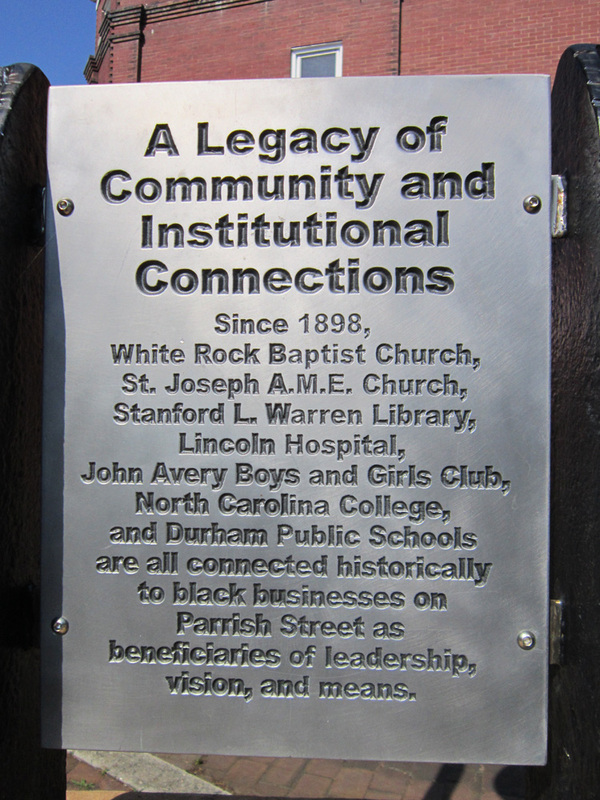 A Legacy of Community and Institutional ConnectionsWhite Rock Baptist Church, St. Joseph A.M. E. Church, Stanford L. Warren Library, Lincoln Hospital, John Avery Boys and Girls Club, North Carolina College, Durham Public Schools are all connected historically to black businesses on Parrish Street as beneficiaries of leadership, vision, and means. Sponsor: U.S. Department of Housing and Urban Development. Funds granted with the assistance of Representative David E. Price. Post dedication use: This monument, and the entire series of Parrish Street sculptures, is part of a larger revitalization effort by the city of Durham. Subject notes: Important institutions in the community are closely tied to the businesses that have thrived on Parrish Street. Some of those institutions are the Boys and Girls Club, Durham Public Schools, Lincoln Hospital (which provides a free clinic for those in the community who cannot afford health care), and many others. Without the support from businesses on Parrish Street, many of these civic institutions would not have had the financial backing necessary to succeed. Location: The sculpture sits on historic Parrish Street, which is better known as "Black Wall Street." It is part of a series of six sculptures that each commemorates important pieces of Durham's history. Landscape: This sculpture is in downtown Durham. There are a few trees close to the monument.